How Much Are All Christian Lopez’s Gifts Worth? One day after trading closer Francisco Rodriguez (and his vest) to the Milwaukee Brewers, general manager Sandy Alderson took to the public airwaves (and reporters' conference calls) to explain the move. Not that the move needed explaining. Part of him must have wanted to say, "I just saved $11 million and gave up about 25 innings of slightly above-average pitching. You're welcome. Bye." When you really break it down, the K-Rod trade is really the first major move Alderson has made since taking over as general manager. (The team's 2011 transaction list consists almost entirely of placing players on the disabled list, along with the occasional "minority share of team sold for $200 million.") But it really wasn't that much less of a no-brainer than releasing Oliver Perez and Luis Castillo, or signing one of the team's draft picks. Rodriguez had to go, and Alderson found a team desperate enough for a division title to make it happen. Which is why Alderson wasn't lying when he claimed, repeatedly, that the Mets aren't giving up on the season with the trade. "From my standpoint this certainly does not signify a change in direction from our continuing attempt to win games this season," Alderson said on a conference call. "But I do want to make it clear, that the Rodriguez trade should not signal anything to anyone about Beltran. I think far more important in that situation will be realistically how we play over the next week, two weeks, three weeks and how the season develops." It's that "about Beltran" part that signals Alderson's next move. Alderson is fully aware that the Mets' chances of making the playoffs, even if Carlos Beltran hits three homers a game every game, are extremely small. They will remain extremely small, even if the Mets win eight of their next ten. 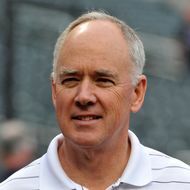 Alderson is saying that the Mets will continue to try to win games, which is nice of them, but that they will think about trading Carlos Beltran when it appears the Mets won't make the playoffs. It appears the Mets won't make the playoffs right now, which Alderson knows as well as anyone. But it doesn't hurt to let Beltran hit some more homers over the next fortnight. You never know: Maybe the Braves will suddenly lose ten in a row, and the Mets will win ten in a row, and Alderson looks like a genius. Or he just trades Beltran to the Giants for a prospect, and he looks like a genius. After the last regime, it's not nearly as hard to look like a genius.